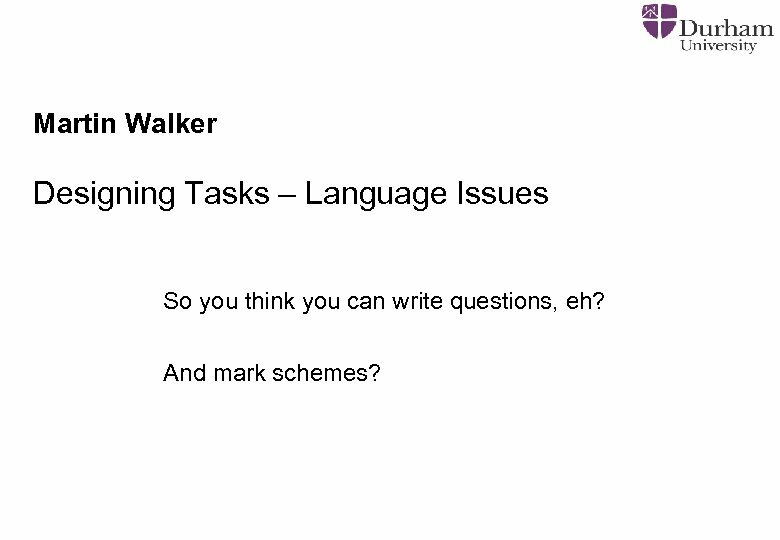 Martin Walker Designing Tasks – Language Issues So you think you can write questions, eh? 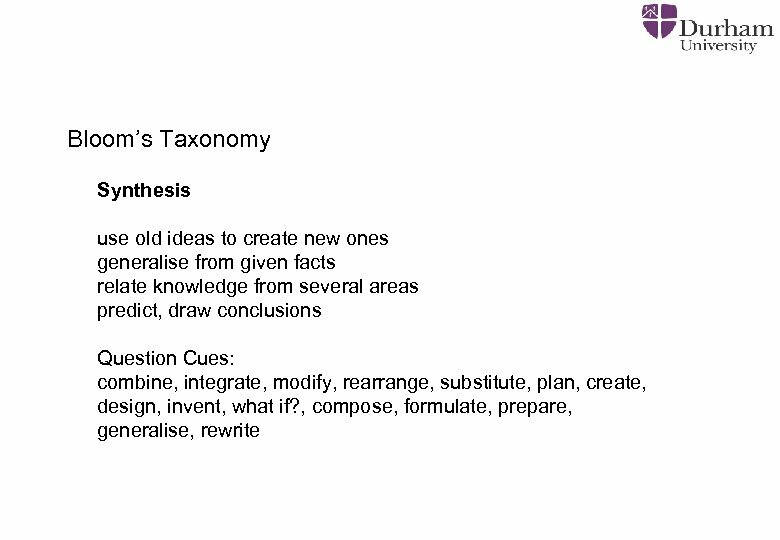 And mark schemes? SIR Paul Mc. Cartney wept openly as he serenaded his bride after their wedding yesterday. The Beatle, 69, plugged in his guitar at the reception to sing a ballad he had written to seal his love for US heiress Nancy Shevell, 51. After the wedding at a London register office, he said: "I feel absolutely wonderful. " 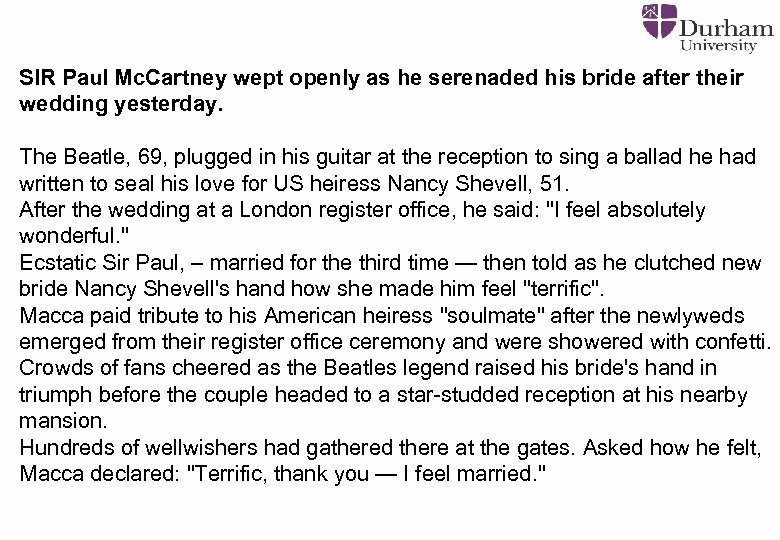 Ecstatic Sir Paul, – married for the third time — then told as he clutched new bride Nancy Shevell's hand how she made him feel "terrific". Macca paid tribute to his American heiress "soulmate" after the newlyweds emerged from their register office ceremony and were showered with confetti. Crowds of fans cheered as the Beatles legend raised his bride's hand in triumph before the couple headed to a star-studded reception at his nearby mansion. Hundreds of wellwishers had gathered there at the gates. Asked how he felt, Macca declared: "Terrific, thank you — I feel married. " 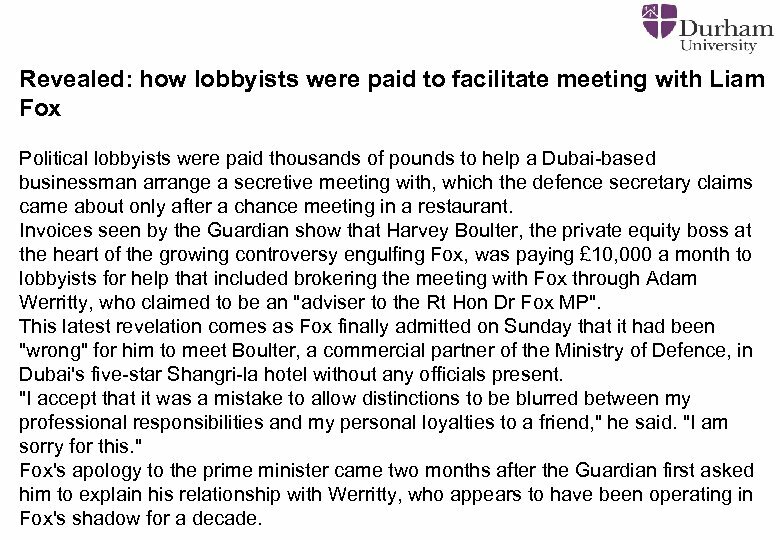 Revealed: how lobbyists were paid to facilitate meeting with Liam Fox Political lobbyists were paid thousands of pounds to help a Dubai-based businessman arrange a secretive meeting with, which the defence secretary claims came about only after a chance meeting in a restaurant. 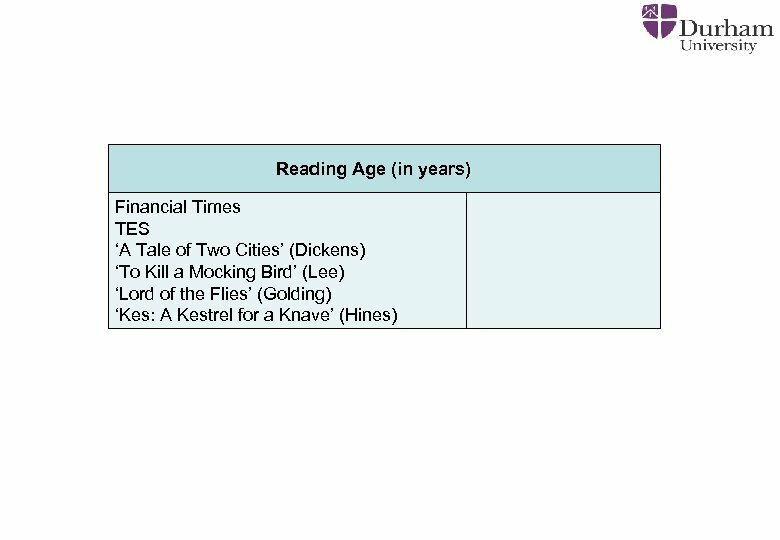 Invoices seen by the Guardian show that Harvey Boulter, the private equity boss at the heart of the growing controversy engulfing Fox, was paying £ 10, 000 a month to lobbyists for help that included brokering the meeting with Fox through Adam Werritty, who claimed to be an "adviser to the Rt Hon Dr Fox MP". This latest revelation comes as Fox finally admitted on Sunday that it had been "wrong" for him to meet Boulter, a commercial partner of the Ministry of Defence, in Dubai's five-star Shangri-la hotel without any officials present. 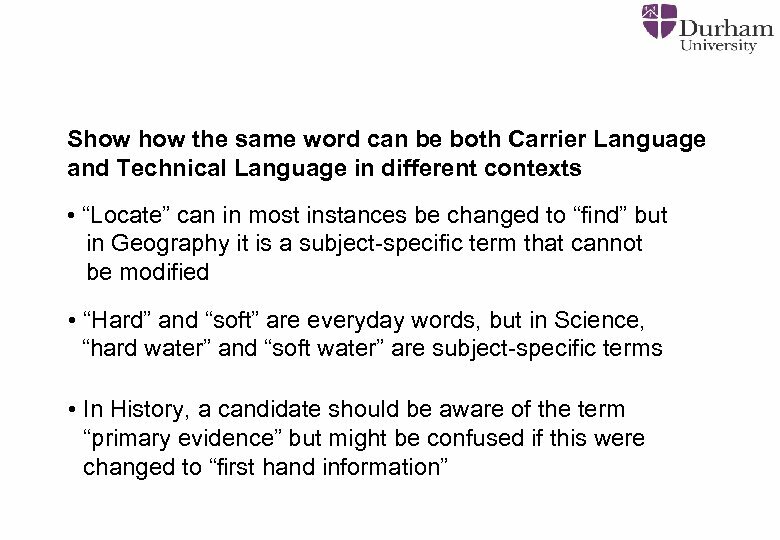 "I accept that it was a mistake to allow distinctions to be blurred between my professional responsibilities and my personal loyalties to a friend, " he said. "I am sorry for this. " 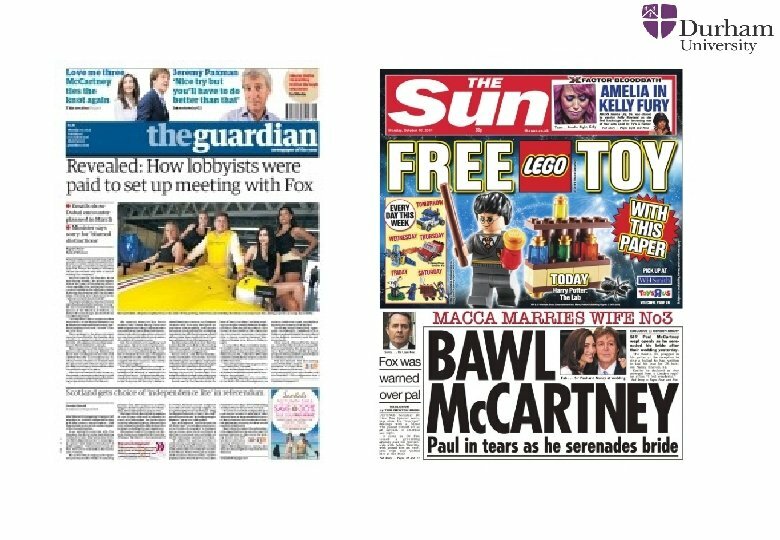 Fox's apology to the prime minister came two months after the Guardian first asked him to explain his relationship with Werritty, who appears to have been operating in Fox's shadow for a decade. 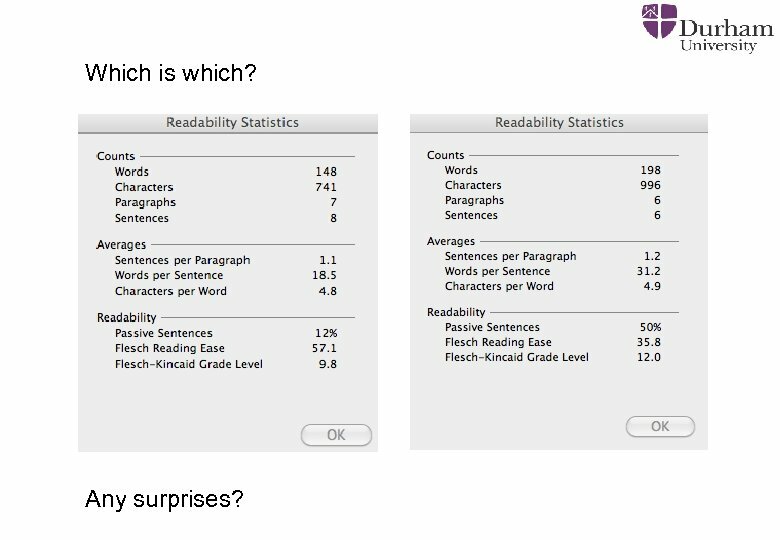 Which is which? Any surprises? 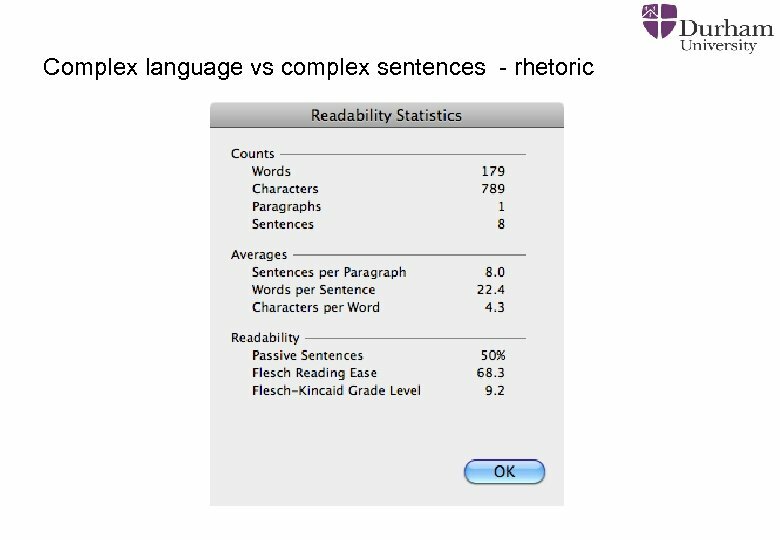 Complex Language This plainer version removes empty phrases such as “given that” and is more elegant and easier to grasp. 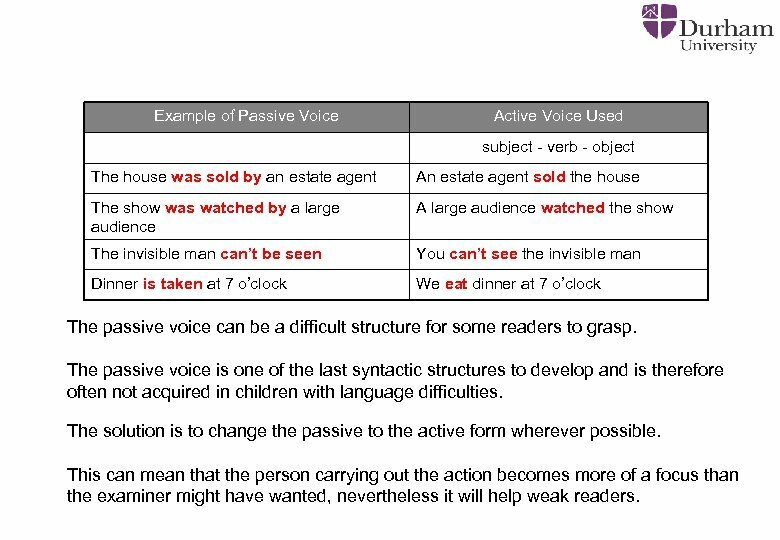 Example of Passive Voice Active Voice Used subject - verb - object The house was sold by an estate agent An estate agent sold the house The show was watched by a large audience A large audience watched the show The invisible man can’t be seen You can’t see the invisible man Dinner is taken at 7 o’clock We eat dinner at 7 o’clock The passive voice can be a difficult structure for some readers to grasp. 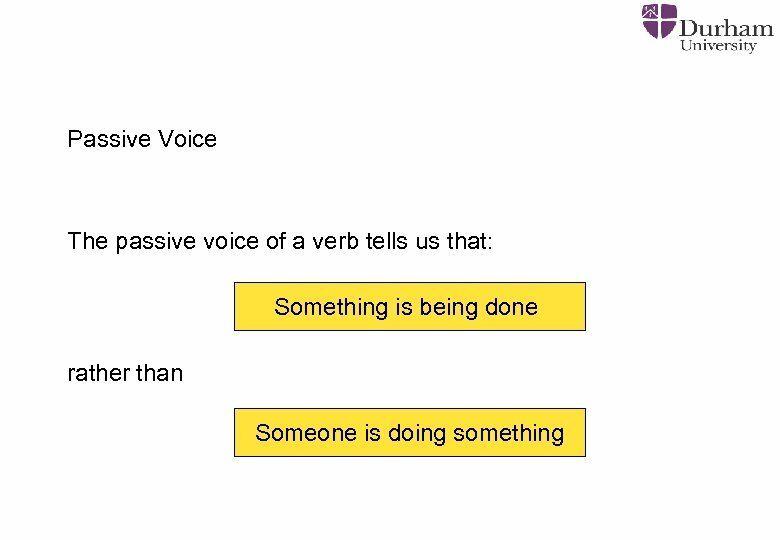 The passive voice is one of the last syntactic structures to develop and is therefore often not acquired in children with language difficulties. 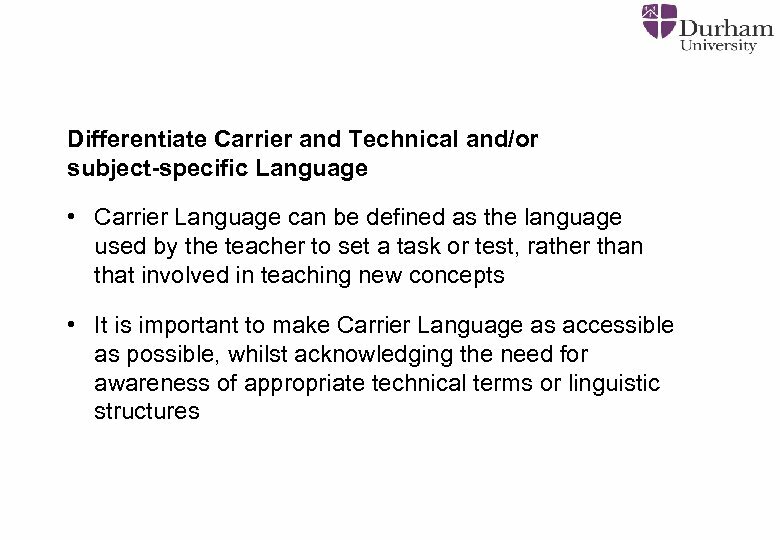 The solution is to change the passive to the active form wherever possible. 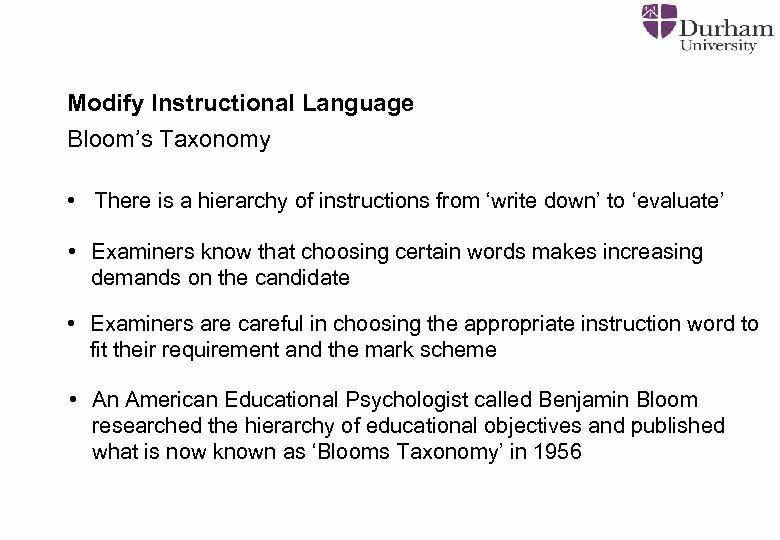 This can mean that the person carrying out the action becomes more of a focus than the examiner might have wanted, nevertheless it will help weak readers. 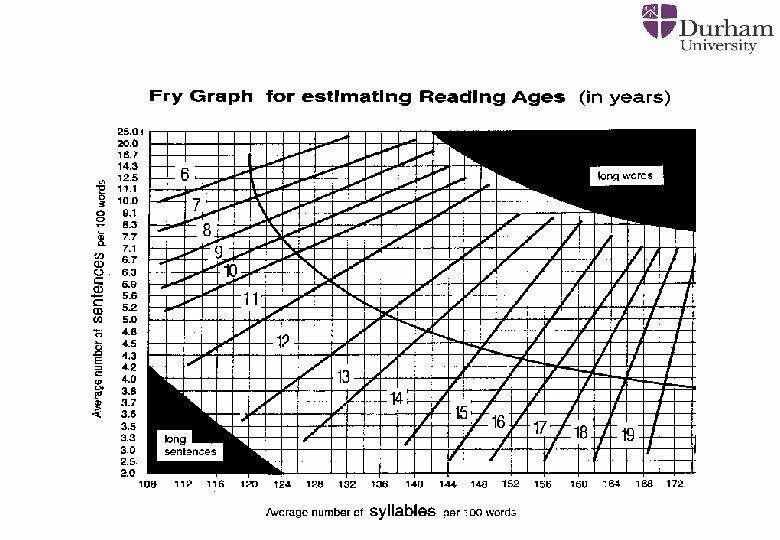 Identify two faults that have been made in the design of the experiment shown, describing in each case how the fault can be corrected. 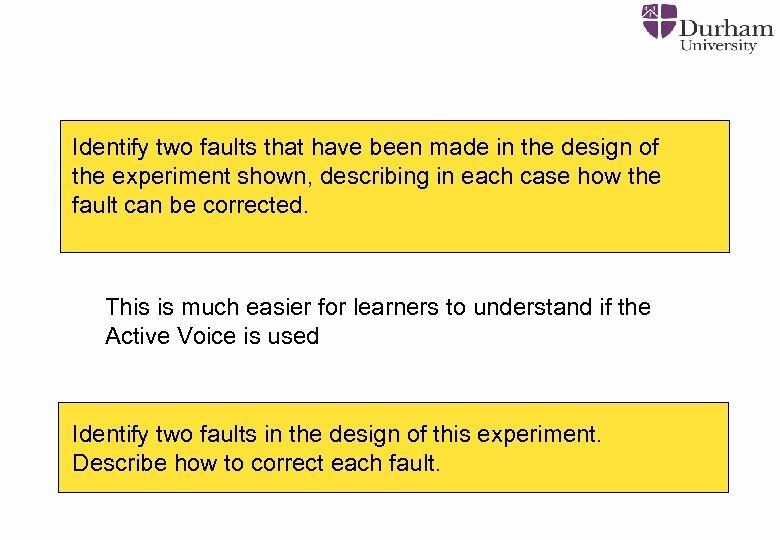 This is much easier for learners to understand if the Active Voice is used Identify two faults in the design of this experiment. 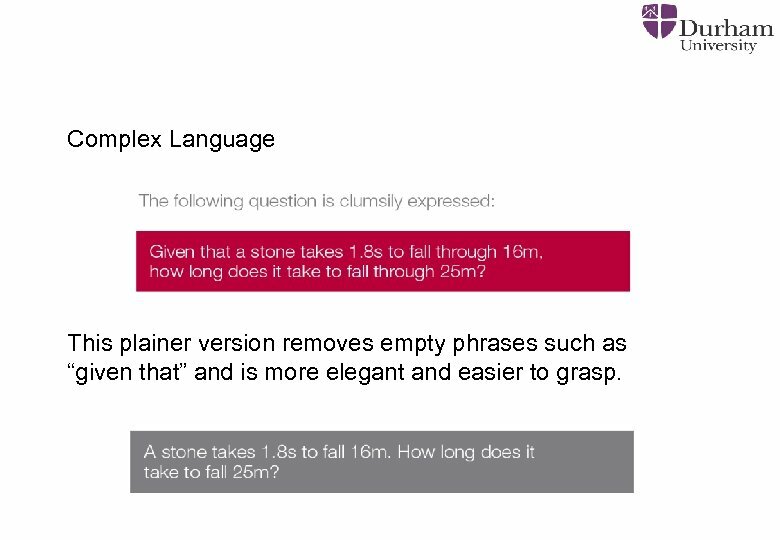 Describe how to correct each fault. 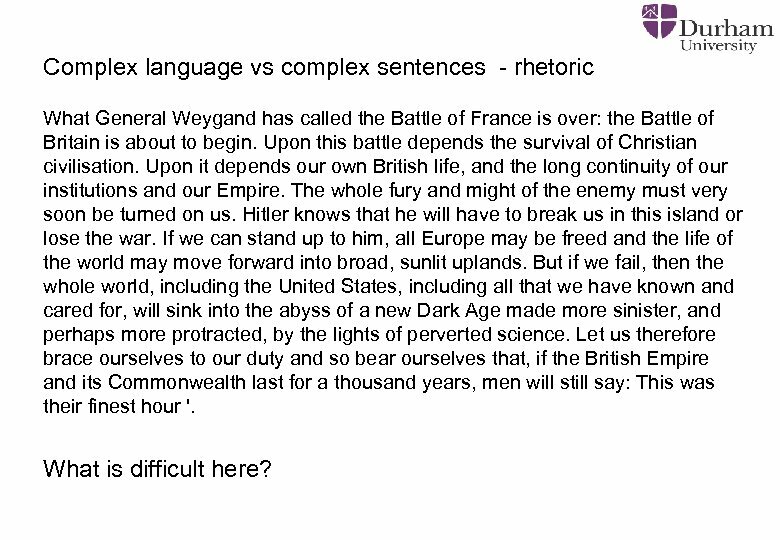 Complex language vs complex sentences - rhetoric What General Weygand has called the Battle of France is over: the Battle of Britain is about to begin. Upon this battle depends the survival of Christian civilisation. 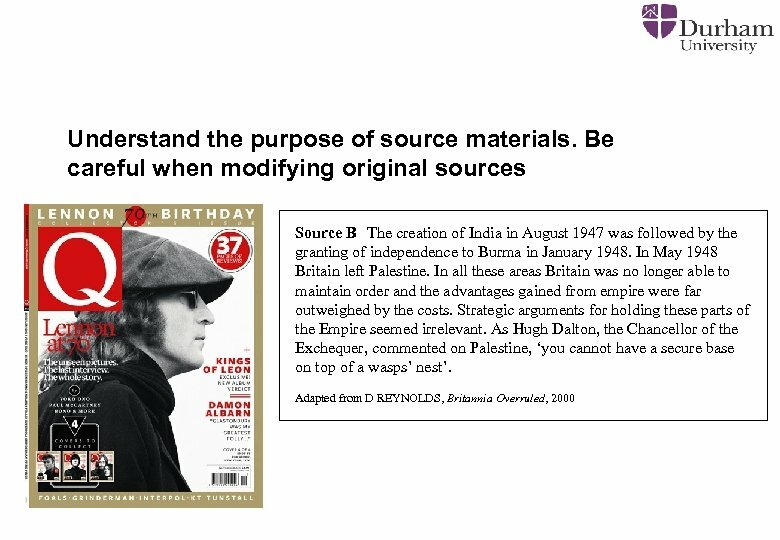 Upon it depends our own British life, and the long continuity of our institutions and our Empire. The whole fury and might of the enemy must very soon be turned on us. Hitler knows that he will have to break us in this island or lose the war. If we can stand up to him, all Europe may be freed and the life of the world may move forward into broad, sunlit uplands. But if we fail, then the whole world, including the United States, including all that we have known and cared for, will sink into the abyss of a new Dark Age made more sinister, and perhaps more protracted, by the lights of perverted science. Let us therefore brace ourselves to our duty and so bear ourselves that, if the British Empire and its Commonwealth last for a thousand years, men will still say: This was their finest hour '. 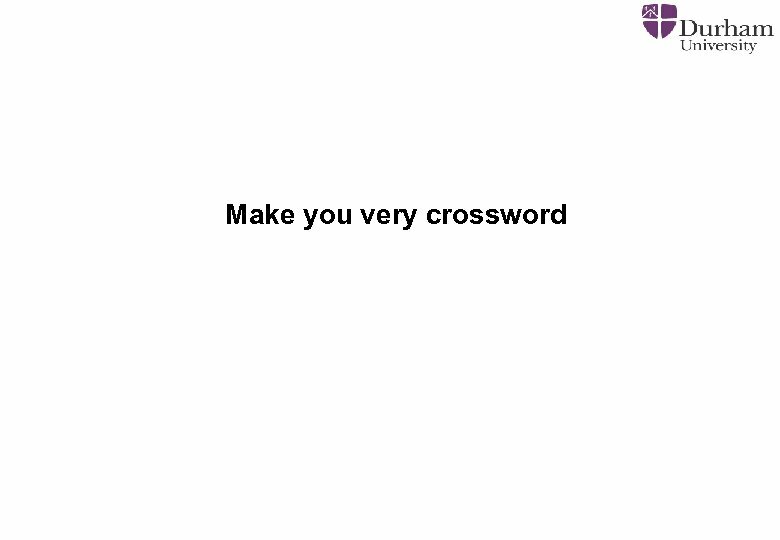 What is difficult here? I am Sam Sam I am That Sam-I-am! I do not like that Sam-I-am Do you like green eggs and ham I do not like them, Sam-I-am. I do not like green eggs and ham. Would you like them Here or there? I would not like them here or there. I would not like them anywhere. I do not like green eggs and ham. I do not like them, Sam-I-am Would you like them in a house? 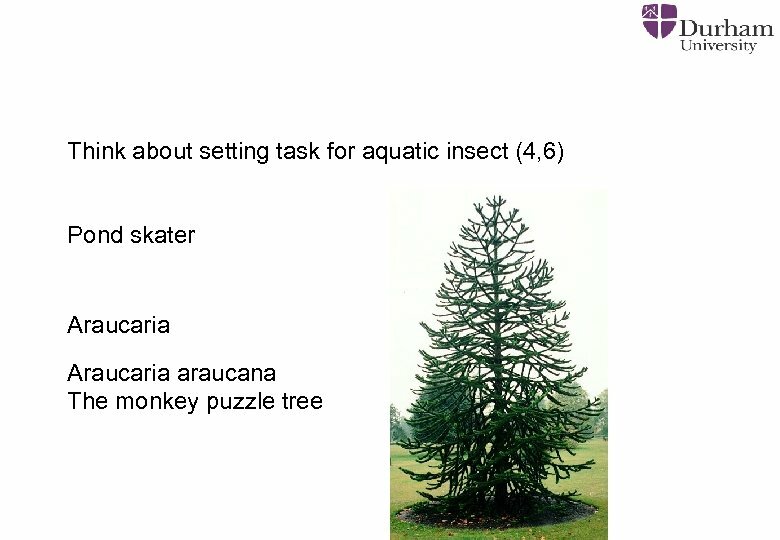 Would you like them with a mouse? I do not like them in a house. I do not like them with a mouse. I do not like them here or there. I do not like them anywhere. 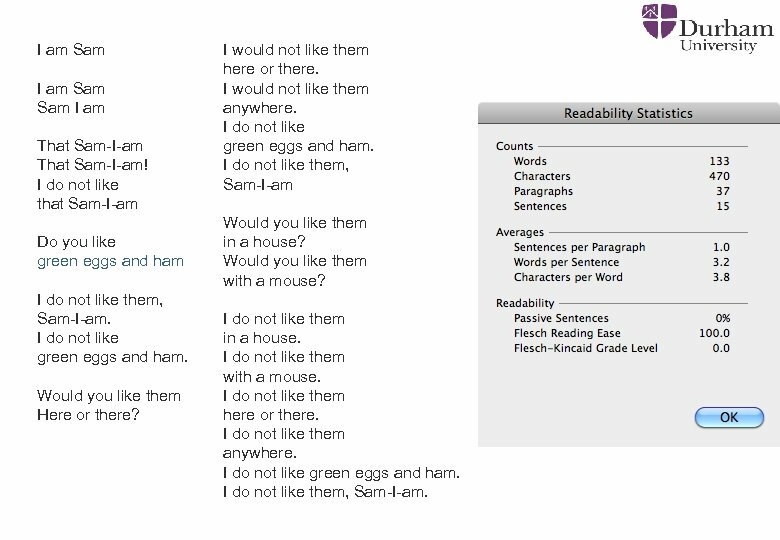 I do not like green eggs and ham. I do not like them, Sam-I-am. 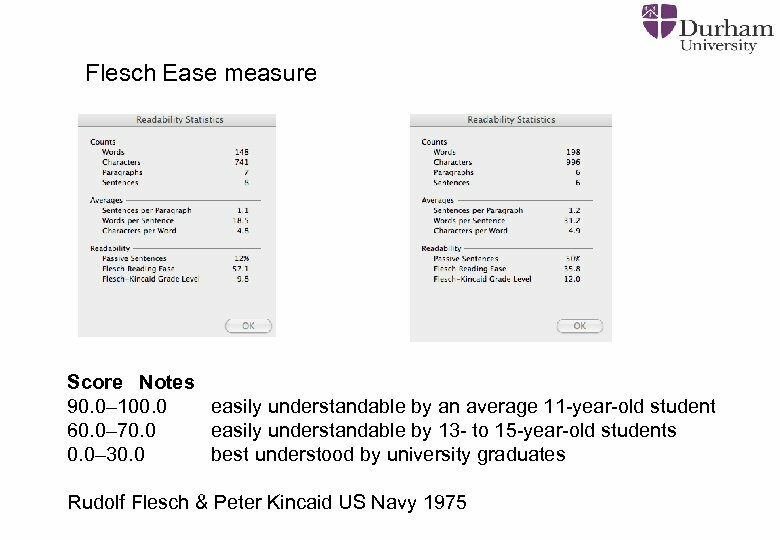 The negative can be a very difficult concept for some learners. It can almost always be avoided. 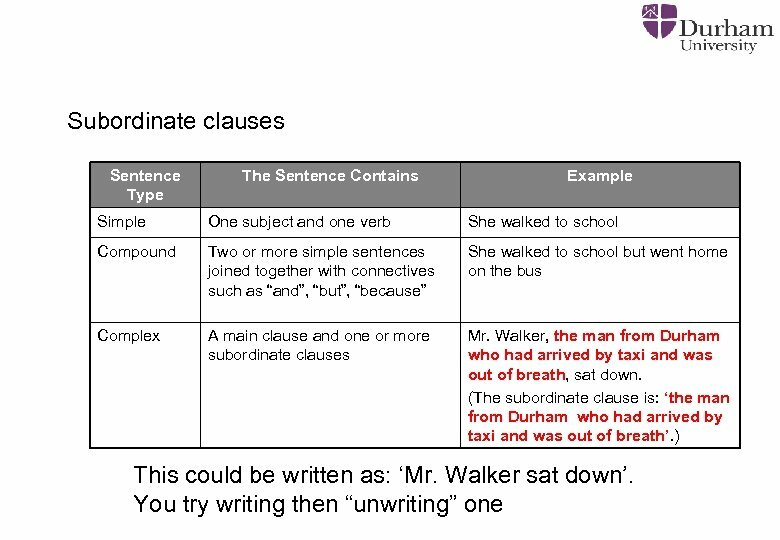 Avoid negative (‘not’) or partly negative (‘only’) expressions wherever possible. 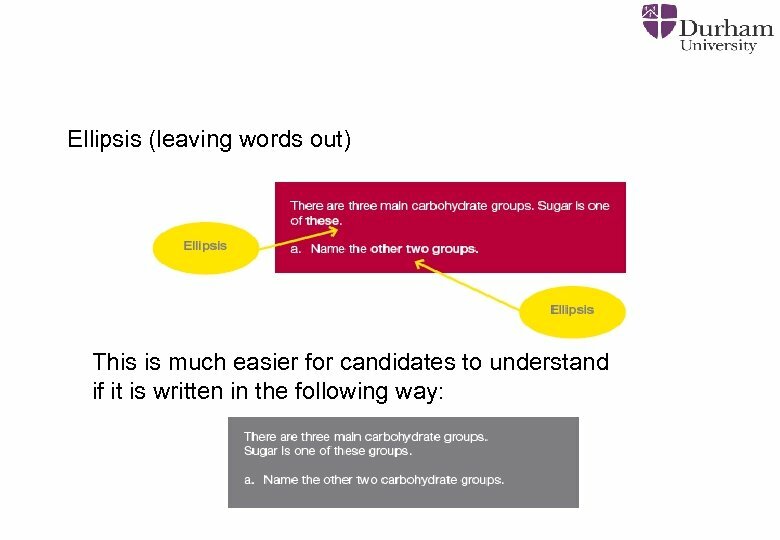 If a negative is essential to the question, try to phrase the question so that it ends in the word “except”. 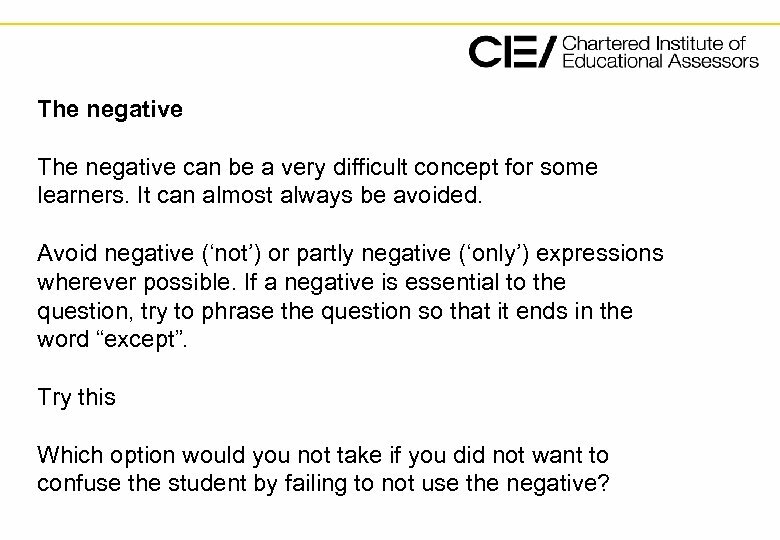 Try this Which option would you not take if you did not want to confuse the student by failing to not use the negative? 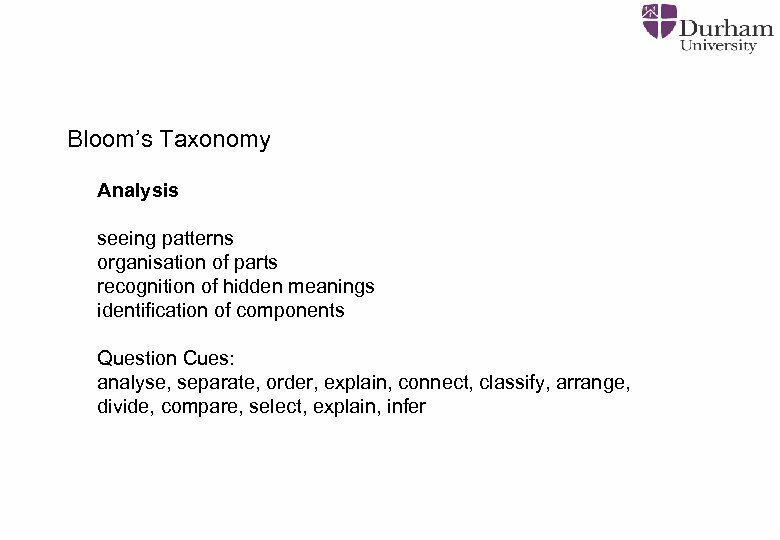 Modify and simplify the language whilst retaining the level of conceptual difficulty of the question Q 1 If a student were provided with three painted metal rods, one of which was known to be made from brass, one from magnetised steel and one from non-magnetised steel, describe how, without scratching the paint, the student could identify each of the rods. 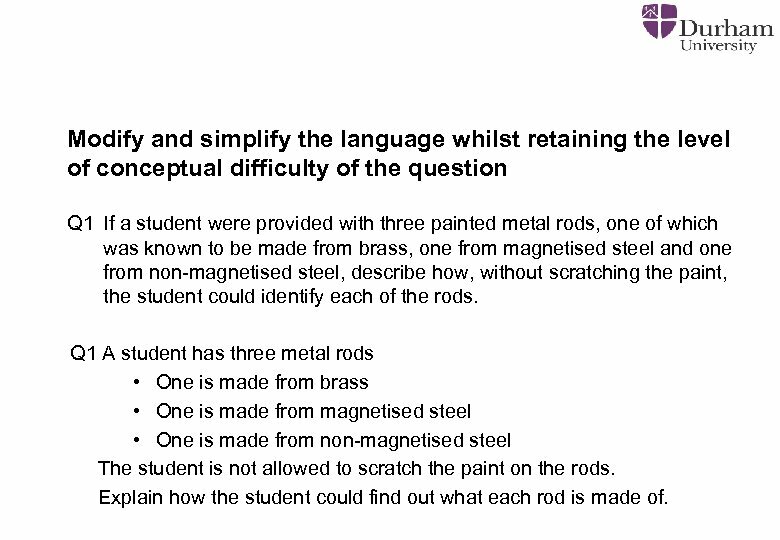 Q 1 A student has three metal rods • One is made from brass • One is made from magnetised steel • One is made from non-magnetised steel The student is not allowed to scratch the paint on the rods. 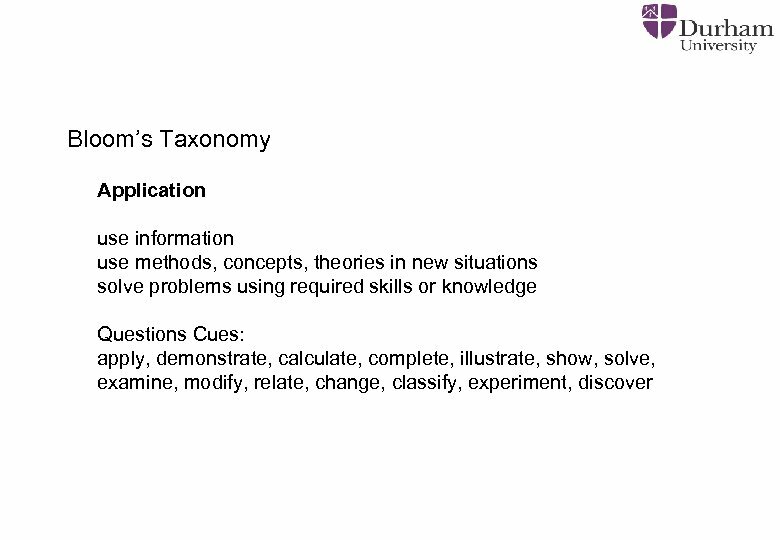 Explain how the student could find out what each rod is made of. 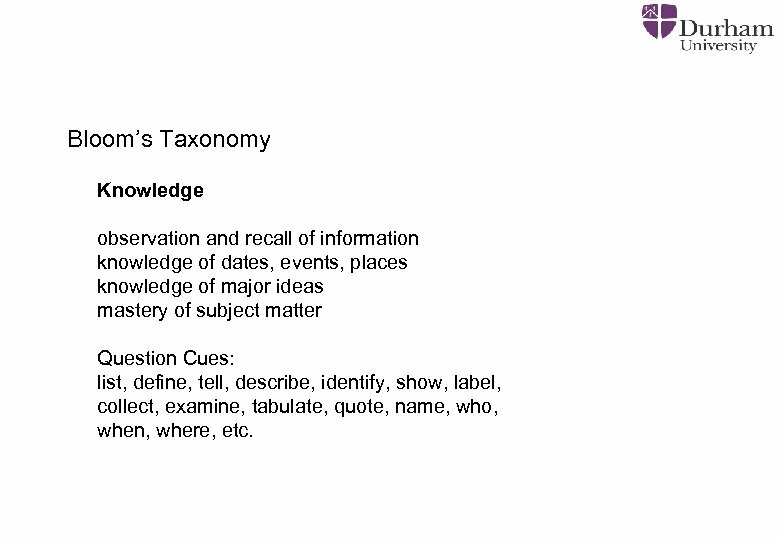 Bloom’s Taxonomy Knowledge observation and recall of information knowledge of dates, events, places knowledge of major ideas mastery of subject matter Question Cues: list, define, tell, describe, identify, show, label, collect, examine, tabulate, quote, name, who, when, where, etc. 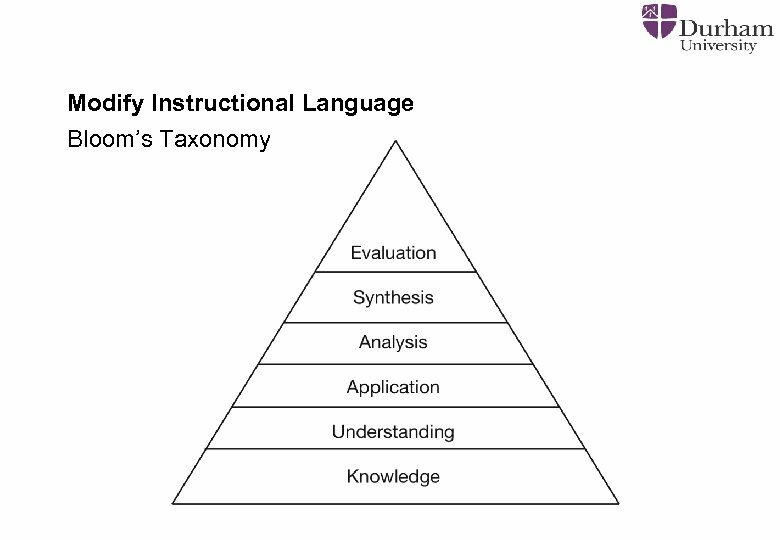 Bloom’s Taxonomy Evaluation is concerned with the ability to judge the value of material (statement, novel, poem, research report) for a given purpose. 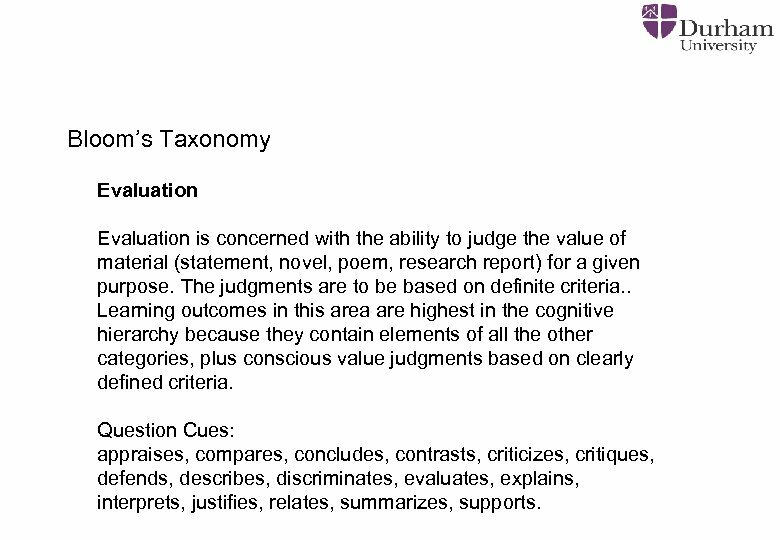 The judgments are to be based on definite criteria. . Learning outcomes in this area are highest in the cognitive hierarchy because they contain elements of all the other categories, plus conscious value judgments based on clearly defined criteria. 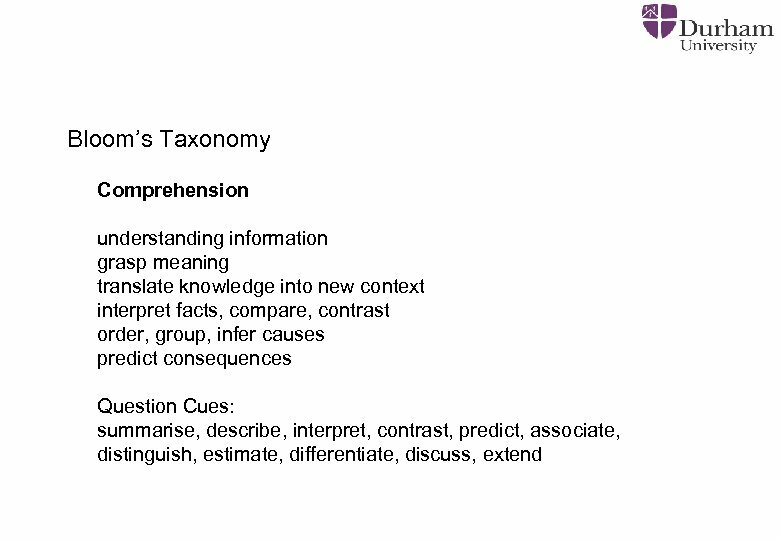 Question Cues: appraises, compares, concludes, contrasts, criticizes, critiques, defends, describes, discriminates, evaluates, explains, interprets, justifies, relates, summarizes, supports. 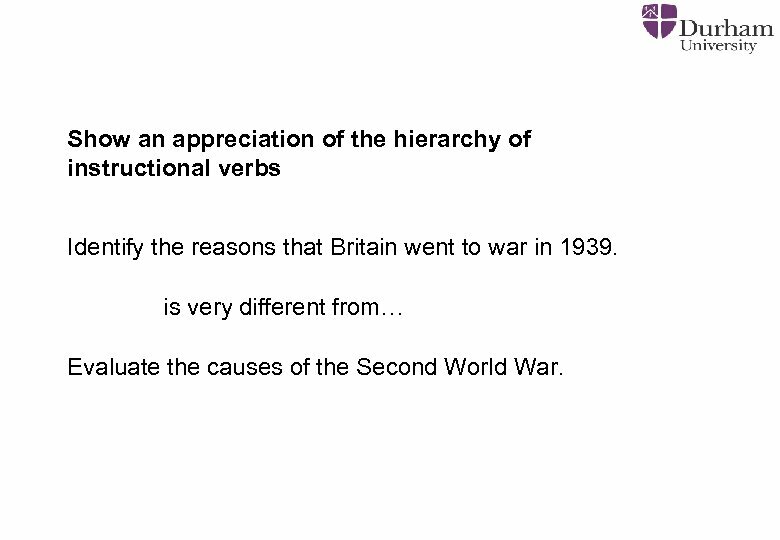 Show an appreciation of the hierarchy of instructional verbs Identify the reasons that Britain went to war in 1939. is very different from… Evaluate the causes of the Second World War. 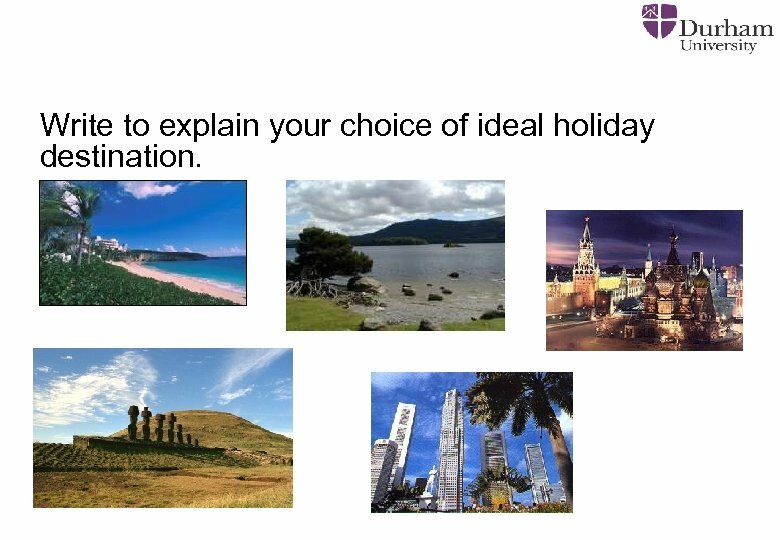 Writing Task - Inform/Explain Write to explain your choice of ideal holiday destination. 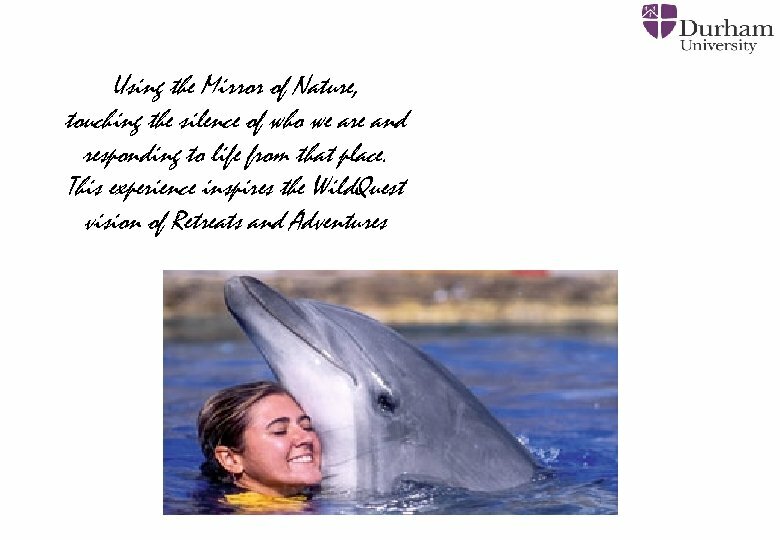 Write to explain your choice of ideal holiday destination.